6-8 Greenhaugh Street, Govan, Glasgow. In the 1890s John Watson spirit merchant owned these premises, the pub only had one entrance then with one large window. John Watson was the president of the Glasgow Wine Beer and Spirit Trade Association, his father was Charles Watson wine & spirit merchant, who had his headquarters in West George Street and was one of the agents for Talisker whisky. 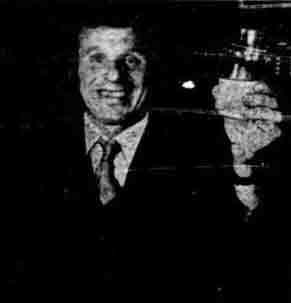 John Watson also owned some of the best bars in the city of Glasgow, Govan was not part of Glasgow then, he owned pubs at 164 Garscube Road, 330 Garscube Road, 57 Maitland Street, 130 Main Street, Maryhill, 136 Rottenrow and 121 Shamrock Street, a business his father set up many years before hand. John met Maggie Yuill, a farmers daughter who was living out at Haghill House, East Kilbride, they were married and moved to Glasgow to set up a family. When John passed away around 1903, his wife took over the business, John owned most of his establishments which meant he was quite a wealthy man. Over the next few years some of the pubs were sold off, Miss Anne H Watson there daughter then took over the licence's which then consisted of Greenhaugh Street and Garscube Road premises. In the 1930s Charles Hall Watson became the licence holder for a while, Miss Anne H Watson was still connected with this pub for many years. In 1960 Archibald S Mitchell was trustee for the late Anne H Watson, he was also licence holder for many other pubs in the city including, Secretary for Rogano Ltd, 137 Kilmarnock Road, North Street and Royal Exchange Place, and trustee for the late David Dunbar, 62 Renfrew Street. A few years later James Ballantyne took over as licence holder on behalf of Watson Govan Ltd, he stayed in this position until the 1970s. There was another well known gentleman in Govan called Charles C Watson who owned the Old Vic, 669 Govan Road. The bar was refurbished in 1955. 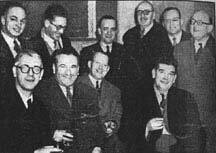 Group of friends and licence holders at the opening of the Old Vic, Mr G C Millen, N Foulger, G Grier, I Sinclair, J E Jackson, C Cullen, J H Wylie, W Johnston, R Lemon and J Millen. Govan Ward at an annul dinner dance at the Marlborough. 1959. Back row Mr C C Watson, Mr & Mrs Mulholland, Mr & Mrs W Coggans, Mr & Mrs J Whyte, Mr James Anton, Bailie Robertson, Bailie Wardley and Mr Neil Foulger. Front row Chief Superintendent Donald Campbell, Mrs Campbell, Mr T F Flynn, Mrs Johnston, Mr W M Johnston, Mrs Wardley, Mr J R Matheson, director of James Murray Ltd and Mrs Robertson. Why a pub owner says "Drink tea!" Fred Sutherland owns one of the busiest pubs in Govan, yet he actively encourages many of his customers NOT to drink. In fact, Fred is delighted when customers ask for a soft drink or a cup of tea! Reason is that Fred is an alcoholic whose drinking almost ruined his business, his marriage, and his family life. "I was so bad that I had to be put into a psychiatric unit and almost tore my fingers to the bone trying to get out," he says. Now he runs Watson's Bar in Greenhaugh Street. Now does he reconcile selling booze to people, and possibly putting them in the same position as he was in nine years ago? Fred almost growled, "Have a look around the bar" I looked round. Three blokes were drinking orange juice and another a cup of tea. "These fellows were having a drink problem. Their marriages were falling apart. I could see what was happening to them. "I talked to them and took them along to group therapy meetings. Now things are a lot better for them. "Look, there is no way you can stop a man or woman from drinking. But when you are behind a bar you can see what's happening to the fellow at the other end of the drink. And you can try and help him. "When I see someone with an obvious drink problem I tell him don't take any more, look what happened to me." "Then I tell him about my own horrific experience of being an alcoholic, how I ended up with my marriage on the rocks and a bankrupt, and how after I decided on group therapy treatment it took me five years to clear my debt. "You ask if I can reconcile selling booze with my own experience. The answer is yes, I can." How does a top Scots football team relax before a top game? Rangers are doing it at Largs until they meet FC Zurich at Ibrox Park tomorrow evening in the European Champions' Cup match. Under the watchful eye of manager Jock Wallace the players are staying at the Marine and Cairnies hotel at the south end of the frose at Largs. "The lads are having this break as a change from the vigorous atmosphere of training at Ibrox," and general manager Willie Waddell. This hotel has a sporting history, for the Cairnhall Park was built as a private house in 1813 by Dr. John Cairnie, a curling and yachting enthusiast. In the garden he laid out one of the first artificial curling ponds in Scotland, it's now a putting green, and he became first president of the Royal Caledonian curling Club. A jetty he built on the shore opposite is still known as Cairnie's Quay and is used by yachtsmen. 1950 Miss Anne Hall Watson. 1918 Miss Anne Hall Watson. Mrs & Mr Charles C Watson at the opening of the Old Vic, Govan Road. 1955. John E Jackson, Mr S Guymer, in the middle Mr C Watson, Mr D Garrow and Mr A Thomson, Oakbank Bar, front Mr N Foulger. 1958.